Firstly: normally, I’m a fan of BodyGlide. But it didn’t help my poor feet yesterday, much at all. So, the photo I took of the pinked package at the Marathon Expo, before the race, just seems to add a little salt to my blistered feet, and as such, I’m sharing it here. Pink lids on perfectly fine silver bullets aside, I had a good 10-mile race yesterday, posting (1:27:41) almost exactly the same time as I posted on the same distance in late May (1:27:40). This could have been disappointing, if I hadn’t just [finally] ditched the head cold I’ve been fighting for two weeks, if the cheering crowds weren’t so darn helpful, and if I hadn’t run the 20 miles I ran in the Bourbon Chase, last weekend. I never fully caught up on sleep from that relay, though I did put in some double-digit sleep-hours nights, midweek last week. This may be the first cold/flu that I didn’t try and scare off by maintaining my usual training schedule for the duration. Could it be, that in my advanced age I’m actually gaining wisdom? One can only hope. I missed a PR by two seconds, but for the most part I’m feeling like my training this summer has paid off. I managed a negative split, yesterday, and attacked the hills with gusto. Over the last several months, I did a good variety of training, including some backpacking at altitude in July, weekly “boot camp” classes, and step-running with friends, on a few dark mornings. Aside from some angry skin on my feet and a worry that the cold may return, I am feeling healthy and injury-free. I wore my finisher t-shirt for the rest of the day, and I don’t do that often! 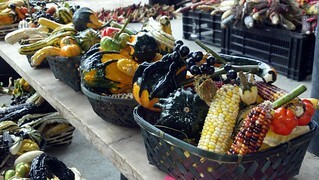 October at the farmers’ market: abrasive? The only problem I need to resolve is with the skin on my feet. While my legs and lungs didn’t feel entirely spent by the end, my feet sure as heck did and I was pleased as punch to cross that finish line when I did. I have six blisters right now; four of them are new. The next few weeks may include some experimentation with non-wool socks, and with a different shoe and/or insole. It now occurs to me that my activities this past weekend had something in common: abrasion. My feet are raw. So is my face (two bruises, with one small cut), due to a sleepy, clutzy altercation with my dryer door on Friday morning. Both of the books I’m reading are adventure stories that describe a significant amount more discomfort that I recently handled, and yet I keep with them: Wild: From Lost to Found on the Pacific Crest Trail, and Into The Silence: The Great War, Mallory, and the Conquest of Everest. I’m finding the “Wild” book to be not all that enjoyable –in fact, the experience chafes, a bit– but that’s for another post. And yet despite this apparent theme, I feel recharged, and possibly even smarter, enlightened. This could be due to the delicious, super-sweet Honey Stinger Waffle that I just downed (another marathon Expo find), and I’m about to plunge into a sugar-induced energy crevasse. Or, perhaps not. I’m glad I’ve picked my hobbies well, and they help me grow. The Next Step: After your race, light and steady training will help you avoid postrace pitfalls. The Importance Of Recovery After A Marathon. I’m not a marathoner, but I’ve run a race or two for 3 hours, before. This is good stuff. I’m new-t-shirted out, but still love the “Trail Run” t-shirt that RunPrettyFar, who had a booth at the Expo, sells! At the Expo I bought an Amphipod arm band, that allowed me to run with my huge Android phone, not because I raced with music, but because I needed the phone to contact my husband for a ride home, after the race. It worked well, perhaps too well: I didn’t even pause to retrieve the phone and take a camera pic, even once, the whole morning. But, I may use it again at a fun trail race next weekend, when I don’t plan to break a PR. Those may be my first in-race pics, ever!